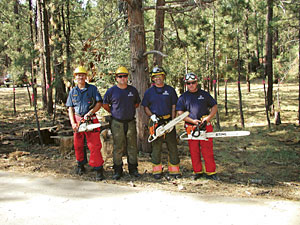 Being a successful logger in California takes more than a hard hat and a saw. Primarily it takes a strong dedication to the profession that provides the drive to bring all of the parts of a logging operation together in a way that it functions efficiently and safely. A substantial investment and good credit are needed to assemble the often very expensive equipment, pay employees and maintain a cash flow that pays the bills while waiting for a payment from customers or clients. The amount and mix of the equipment depends on the type of logging to be accomplished but includes at least chainsaws for cutting , bucking and limbing (see Lumberjack Language) of trees: a skidder to move the logs from where they’re cut to a loading area (called a landing) and a loader to put the logs onto a log truck. Experience and reputation are also the key ingredients in a successful logging operation. What people think of a logger and his work bears directly on his or her ability to line up logging work season after season. A Hazardous Substance Communication Plan if you store and use hazardous substances such as diesel, lubricating oils, hydraulic fluids and similar materials common to logging. A Emergency Response Plan in the event you have an emergency such as a fire or spill that involves the hazardous substances you use. In addition to the operating plans a logger must also carry workers compensation insurance on any employees and of course meet any statutory and regulatory requirements related to the employee compensation, Unemployment Insurance etc. Successful loggers also have a good understanding of the forest as a whole as well as it’s trees, other vegetation, wildlife, soil, and water components. This understanding is important to the successful carrying out of the prescription prepared by a Registered Professional Forester for each harvest operation. Because logging is very seasonal often providing 5 to 7 months of work each year, the logger must be a skilled manager to remain profitable and keep his equipment at state-of-the- art levels. Even though logging is always a challenge and requires a lot of hard work it is a very satisfying profession.